In the fight for internet freedom, what happens when state laws clash with federal rules? The state of Washington has put its foot down on the U.S. Federal Communications Commission’s (FCC) net neutrality repeal, passing a new law that instead safeguards these protections. On Monday, Washington Governor Jay Inslee signed House Bill 2282, which state legislators from both parties passed in February, protecting net neutrality within the state. This new state legislation counters the FCC’s lifting of net neutrality protections put in place in 2015. Under the 2015 rules, no internet service provider (ISP) could discriminate against any online content to favor another, for example, by throttling or speeding up traffic. The repeal will officially end these restrictions by April 23rd. Although Gov. Inslee said during the signing that Washington is “the first state in the nation to preserve the open internet,” it isn’t exactly the case, as the Associated Press mentioned. Oregon actually passed a similar state legislation protecting net neutrality earlier in 2018. 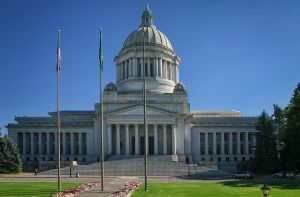 The difference is that Washington’s law will put new requirements on ISPs, and that violations will be enforceable thanks to the state’s Consumer Protection Act. The decision to keep net neutrality rules in the state — a move which 25 other states, including California, Illinois, and New York, are also considering — presents a rather curious conundrum. With federal authorities moving in the opposite direction, do states have any leeway to implement their own rules? Arguments seem to work for both sides in this debate. For example, it’s quite evident that federal laws supersede state legislation. The FCC’s net neutrality repeal, however, isn’t exactly a federal law, but a regulation from a federal agency. Furthermore, as WIRED previously pointed out, an argument can be made against the FCC for violating federal laws that prohibit agencies from setting up “arbitrary and capricious” regulations. On the other hand, federal law limits state authorities from regulating the internet. Moreover, the FCC’s net neutrality repeal order cited historical precedence of the agency’s supposed authority to preempt any state laws. One such case was a 2007 federal court ruling that allowed the FCC to prevent the state of Minnesota from regulating internet phone services in certain way. For former FCC staffer Marc Martin, the issues of preemption remains unsettled. “I wonder if anyone will even fight it,” Martin told WIRED. Instead, the legal battle over a free internet might have more chances with a move similar to Montana governor Steve Bullock’s executive order, which bans state agencies from doing business with non-net neutral ISPs. Nevertheless, more states are determined to fight the FCC’s net neutrality repeal in one way or another. Similar measures are present on a federal level, with a Senate proposal that could reverse the repeal. Meanwhile, Tennessee Republican representative Marsha Blackburn has a less-than-ideal solution pending in the House. With tension building on all sides, it seems a clash for internet freedom is on the horizon.